Published by Warner Bros. Interactive Entertainment and developed by Traveller’s Tales (a.k.a. 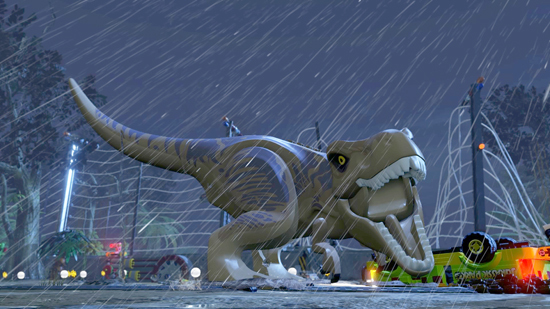 TT Games), LEGO Jurassic World, follows the epic storylines of Jurassic Park, The Lost World: Jurassic Park and Jurassic Park III, and the latest blockbuster, Jurassic World. The main action branches from the first and most recent film as players begin their journey from Isla Nublar or Isla Sorna. This all-ages game uses a third-person, platform format for the formulaic fun with non-stop action, creative environment interactions and a few puzzles. NOTE: gameplay will reveal plot points and surprises from the film series. The record-breaking, sci-fi adventure film Jurassic World is the fourth installment in the film series, but basically continues the plot from the first film Jurassic Park. Jurassic World fulfills the dreams of John Hammond, played by the late Sir Richard Attenborough, who developed an amusement park with actual dinosaurs regenerated through genetic technologies. 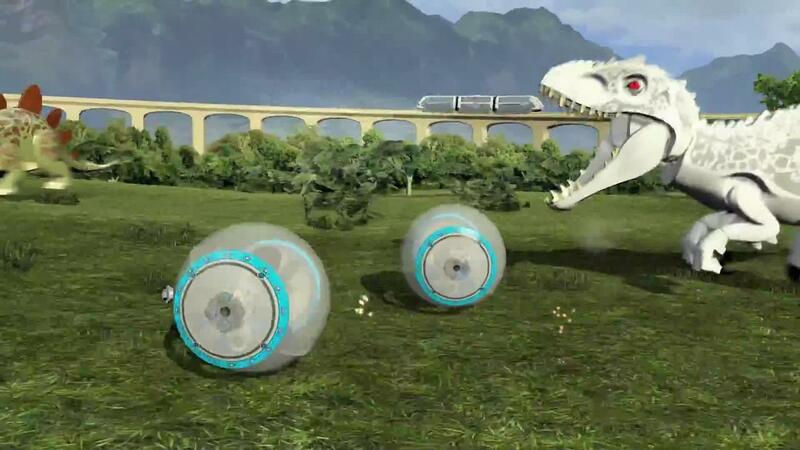 This fully functioning park on Isla Nublar has been going for 10 years now and corporate managers decide to increase the “wow factor” with a new genetically modified dinosaur. Filmed in Hawaii, California, and Louisiana, Colin Trevorrow (Safety Not Guaranteed) directs while Steven Spielberg acts as executive producer. Players get 20 story levels and complete missions to unlock the open world, “free play” modes plus, as in recent LEGO games, additional downloadable content (DLC) expands this enjoyable experience. Build and control your own dinosaurs mixing pieces in the Dino Customizer, which customizes creations, then play the game as the dinosaur. This feature boosts the replay value and overall appeal tremendously so players feel like they get a great deal similar to a special compilation of several games and “killer” customization option all within the familiar LEGO game format that includes an easy, cooperative player drop-in and drop-out option. The controls are relatively smooth though more touch pad options, especially for a map, would have improved the experienced. Players move with the left stick and change camera views with the right stick while toggle through characters using L1 or R1 (a nice plus for left-handed players). Players can change characters using the triangle button (hold for all character options), attack/aim with the square button, jump with the X button (double tap to fly when playing as a dinosaur) and build/activate special abilities using the circle button. The visuals move into a split screen format in multiplayer gameplay then conveniently combine into one when players near each other. The dual screen format and progressive building elements adds unique appeal to the game series while developers keep the visual style intact. The new weather system also plays an important factor in gameplay. Even more dynamic weather changes would have been great. The action works well while the comedy is surprisingly strong as well thanks to the crew and writer Graham Goring (The LEGO Movie Videogame, Lego City Undercover). Players will also encounter some hilariously extreme circumstances to retrieve building items and other pieces to complete missions. Several references, sight gags and sounds/dialogue requires repeated play. Impressive level designs and sharp graphics balance out vices like a few repetitive chase sequences, occasionally repetitive button-mashing and vehicles easily getting stuck. Bigger icons (and even additional audio cues) would have improved the visual displays that show which character must complete the action, especially in situations where players must complete the task before progressing through this quality game. The puzzle aspects are challenging and may not seem intuitive at times, so plan on helping younger and inexperienced players at times. Try the vehicles in free mode first for practice. LEGO Jurassic World also includes helpful text subtitles, entertaining pop culture references, and various learning opportunities. The extensive character cache includes Owen Grady (rising star Chris Pratt), Claire Dearing (Bryce Dallas Howard), and Dr. Wu (BD Wong) who all provide the voice talent. Gone are the days where LEGO game characters grunt, hum and wince instead of talk. Others include Ian Malcolm (Jeff Goldblum), John Hammond (the late Sir Richard Attenborough) and many more where developers used archived voice talent, which diminishes the quality a bit since many scenes with their memorable dialogue had a lower quality due to background noise, etc. Characters and their abilities have some carry over from other LEGO series games (e.g. screams, invisibility, etc.) plus embellished actions that are wisely incorporated with character traits (e.g. matching a dino-debilitating flash photography ability with seasoned photographer character Nick Van Owen (Vince Vaughn). The dinosaur characters include triceratops, raptor, and T.Rex. A solid, all age title with considerable replay value including bonus content and unlockables found in free play mode. Some challenges are hard even on easy mode so younger and inexperienced players might need help. These players may occasionally get stuck in their progression and some of the environment can be too dark to see (depending on your TV settings), but overall, this game succeeds yet again by incorporating a current franchise with LEGO mania. Highly recommended (***1/2 out of four stars) and rated E10+. Remote play (PS Vita) support available on this PlayStation 4 version. Also available on PlayStation 3, Wii U, Xbox One, Xbox 360, Nintendo 3DS, PlayStation Vita and PC. The Jurassic World DLC Pack ($1.99) includes six new characters, two new vehicles, the Jurassic Response Unit, Jurassic World Shuttle and more. Jurassic Park Trilogy Pack #1 grants access to three characters and one vehicle including, Dino Handler, Eric Kirby and Paul Kirby and the Animal Control Vehicle, which is available for purchase for $0.99. Jurassic Park Trilogy Pack #2 for $0.99 provides access to three characters and one vehicle including, Jurassic Park Helicopter Pilot, Lex and Tim Murphy and Iain Malcolm’s San Diego Cruiser. LEGO Jurassic World toy line sets are also available. This entry was posted in Video Game Reviews and tagged Jurassic Park, Jurassic World, LEGO, Michael Siebenaler, Mike Siebenaler, PlayStation, Tall Writer, video games. Bookmark the permalink.